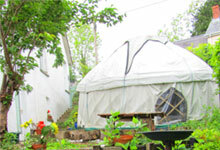 Biddy’s Garden Studio offers unique self-contained holiday accommodation, comprising studio apartment and yurt with garden. It is attached to a Georgian house situated in Llandysul, overlooking the Teifi river with its canoeing and fishing opportunities. Biddy’s Garden Studio combines convenience with a sense of tranquillity, and the fun of staying in a traditional canvas yurt. Llandysul provides a variety of shops and pubs, a terrific Italian café, a leisure centre, swimming pool, canoe club, outdoor tennis courts, park, walks, bird-watching and fishing. The wonderful Heritage Coast is only 25 minutes away and boasts clean and beautiful beaches and coastal paths. Brechfa Forest is also nearby with its cycle trails and footpaths. 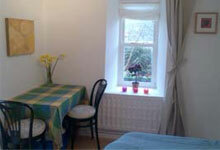 The studio apartment sleeps two in the bedroom/sitting room with TV, and dining table and chairs, It is compact and very cosy. 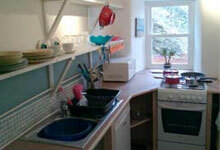 There is a simple, well-equipped kitchen, and excellent shower room. 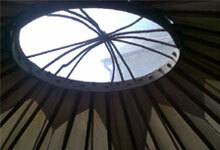 Adjacent is the yurt which sleeps a futher two or three people. 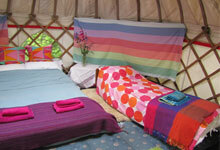 The yurt was made locally and is a traditional circular oak and canvas design. Inside is a magical space, enchanting for children - and adults alike. With its colourful drapes and cushions it makes a wonderful place to relax by day and sleep at night. Up to five people can enjoy an unusual and very comfortable stay which also offers pretty gardens with lovely views, BBQ, and a very short walk to the village centre with all amenities. From May to September 2011: there is a weekly tarriff running saturday to saturday, cost depends on the particular week and the number of people staying, As a guidline prices are from £195 -£ 395 per week. bargain breaks start from £120 for two sharing for a part-week. FOR LAST MINUTE BARGAINS including short stays, and all other information phone: 01559 362781 / 07846 850 068. CLICK HERE TO SEE REVIEWS . We are located on Seion Hill, Llandysul, Ceredigion, West Wales, SA44 4DA.